All the time I was working in the precision GNSS sector, our view of things was that we had an advantage — the technology for dual/multiple frequency was hard to do. It took years to develop and perfect robust L2 codeless tracking to enable its use in everyday challenging applications. So we were always looking to see who was claiming what, and waiting for the technology gap to narrow as lower accuracy providers improved performance. Then came L2C, which commercial providers seemed to virtually ignore, presumably causing much frustration for the GPS program office. L2C is still not a frequency in the international navigation protected band, so interference from regular commercial sources is unregulated — probably not a good long-term bet. But L5? Now that’s protected, and it’s the coming second frequency for not only GPS, but also Galileo (E5a). Even the Indian IRNSS system and Japanese QZSS both use the L5 frequency. So the expectation in high-precision land has always been that soon L1/L5 receivers would start to show up and start to erode the high-end market from the bottom up. Well, Broadcom has just announced a new L1/L5 GNSS chip aimed at the mass market for cellphones. The chip incorporates a complete RF-to-pseudorange receiver and dual-core processing engine that currently produces data for positions and velocities, and generates ionospheric corrections from L1/L5 GPS and E1/E5a Galileo. Dual-frequency receiver and dual processor in Broadcom’s new L1/L5 chip. 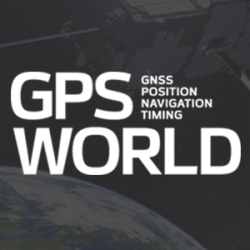 Why bother, when neither the L5 GPS nor Galileo constellations are fully deployed? It just so happens that there are now around 30 satellites broadcasting both frequencies, so at any one time, according to Broadcom, there are about eight in view for a large portion of locations around the world. That’s plenty from which to gather all the dual-frequency signals and derive the data needed to get to 30-centimeter-accurate positions most of the time. And the chip also digs carrier phase out of these signals for dual-frequency processing and detecting cycle slips to improve positioning reliability — bad satellites are discarded from the position solution. So, what does taking positioning from 5 meters with L1-only (Broadcom 4774 chip) to 30 centimeters with L1/L5 (Broadcom BCM47755 new chip) do for OEM manufacturers? 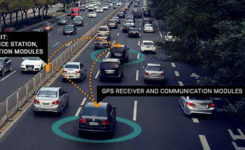 Without external sensor aiding, you can get lane-departure warnings for cars; with more satellite visibility, it enables much-improved down-town navigation. Probably the biggest gain is in reduced power consumption. With 28 nm geometry, the new chip uses 50 percent less power: “current consumption during GNSS tracking can be lower than 5 mA,” claims Broadcom. The question is will the price for OEMs be similar to what they already pay for L1 chips? Broadcom says this will probably be the case. The new chip has already gone through one re-spin as a result of initial testing, and is currently available in sample quantities with production to start “early next year.” Broadcom’s current Tier 1 customers are each at various stages of evaluation, so next year’s cellphones may well incorporate 30-cm positioning. Who can say where else this remarkable chip may find a home? Any OEM wanting a quick way to an L1/L5 receiver might want to incorporate it. Or maybe it could aid reliability if added to automotive lane departure warning systems – who knows? This is just the first mass-market dual-frequency chip receiver announcement. Could there be other developments already underway by other mass-market chip-makers?